Septic arthritis of the hip is seen most commonly in children, and may result in severe disability. While long-term problems are uncommon when prompt surgical drainage and antibiotics are provided, many of the world's children lack access to immediate medical care, and instead present for treatment at a late stage in the disease process. While the majority of cases may not be preventable, significant morbidity can be averted by early recognition and treatment, highlighting the need to strengthen the delivery of health care at primary health centers in such resource challenged environments. 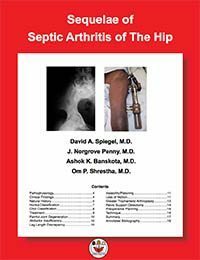 Practitioners caring for musculoskeletal problems in such environments will necessarily be confronted with neglected hip sepsis, and the hope is that the information in this monograph will help to formulate a treatment plan for these challenging cases. The clinical material has been collected from the Hospital & Rehabilitation Centre for Disabled Children in Banepa, Nepal, and from Uganda. Arabic translation by Alaa Azmi Ahmad, Loai Aker, & Yahia Hanbali.